Harris writes instruction manuals for a living and is self-conscious at the best of times. He's not pleased when he manages to break a leg—but he's even less pleased when a pushy friend sends someone to help him around the house while it heals. When the young man in question rides up on a motorcycle, Harris expects the worst. He certainly never plans to fall in love. 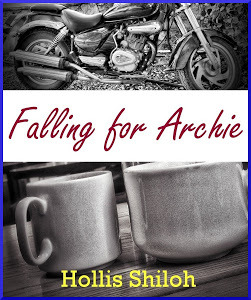 But Archie—short, clumsy, and utterly gorgeous—doesn't make it easy. A contemporary sweet gay romance or m/m romance. "Harris," called Archie at the door to the bathroom. "Could you bring out a bandage?" "For your burn?" asked Harris, blinking. "No, I've cut myself." He sounded embarrassed. "You have? How? You just finished burning yourself." "I know, I know. Could you just bring the bandage? When you come out. I mean, when you're done." Harris smirked. "Of course, Arch." "Oh, thanks," said Archie, sounding witless and breathless. How badly did he cut himself. Also, how? Harris didn't bother with socks and shoes, but left the room still barefoot, bringing the first aid kit. "Let me see?" Archie stood in the middle of the kitchen, looking lost. He held up a red-slicked hand, gripped tightly in his other. Harris made a sound in his throat and reached for it. "Did you wash?" "No. I'm trying to get the bleeding to stop first." Archie sounded rather faint. "Right." Harris looked around blindly. He grabbed a clean kitchen towel and began to wrap Archie's hand tightly. Their hands bumped each other in the fumbled hurry. "Hold this up high and squeeze, best you can. Do you need to go to the hospital?" "No, no, no. I'm fine." Harris steered him towards a kitchen chair and guided him to sit. Archie looked pale. "How did it happen? How do you possibly cut yourself making tea?" He nodded to the table. Harris glanced over and saw the partly open packet of cookies sitting there, a sharp knife next to it. "I always have trouble getting that stupid packaging open, so I thought, why not a knife?" Archie laughed a little breathlessly. "Not your smartest decision." Harris brushed the hair back from Archie's forehead, holding a hand against the soft, warm skin a moment. His other hand gripped Archie's shoulder. Archie leaned against him like one surrendering tension now that he knew he was safe. Harris closed his eyes, carding fingers tenderly through Archie's hair, wishing he could make this moment last forever.